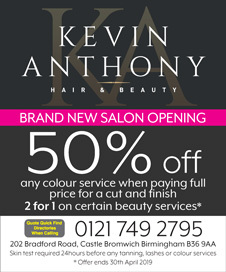 Kevin Anthony Hair & Beauty are a Quick Find directories vetted and recommended local business in Castle Bromwich. Brand New Salon Opening! Offering 50% off any colour services when paying full price for a cut and finish and 2 for 1 on certain beauty services. Offer end 30th April 2019.